It was already lunch time when our plane from Manila landed in Roxas City Capiz, the Seafood Capital of the Philippines. At that time, I was already very hungry. Oh yes! Very hungry! Hahaha! As they are known for seafood, I asked the tourism officer at the airport where I could eat fresh seafood here. 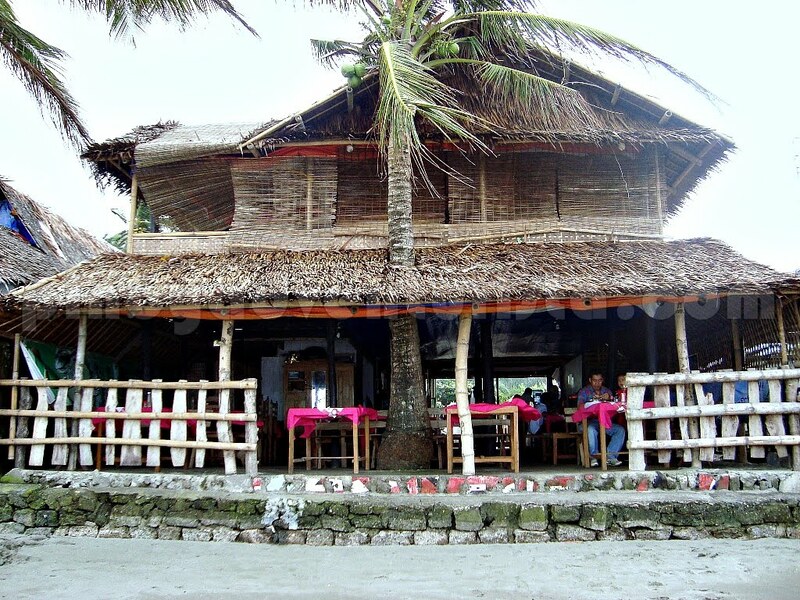 He suggested that I could go with him and he will just drop me at Baybay beach where I could eat fresh seafoods from the restaurants by the beach. Awesome! Free ride to the beach! Salamat po! When we arrived at Baybay beach, I bid goodbye to him and thanked him for the free ride. I was overwhelmed by the wide array of fresh seafoods in front of me. There were Diwal (Angel’s wing), Talaba (Oysters), Scallops, Tahong, Blue Marlin and many others. But since I am alone and I still have 5 days of travel ahead of me and I don't have that "matibay na sikmura" thingy when it comes to seafoods, I'm afraid I will upset my stomach with these seafood. So, I just ordered grilled squid, a cup of rice and a bottle of soda, just to be safe. While waiting for my food to be cooked, I roamed around to feel the sand at the beach and see how things are going. The wind is blowing so hard during that time and the waves are a bit huge. 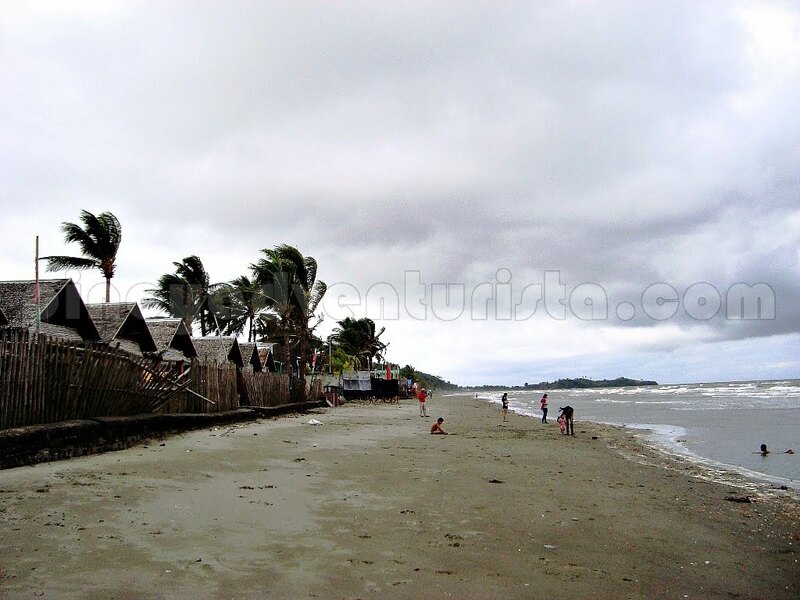 The beach is facing Sibuyan Sea, it is very rugged and has fine gray sand. There were quite a few people swimming, maybe because it's 1 o'clock in the afternoon and most of them are in their homes having lunch or their afternoon siesta. I also went to the People's Park, which also provides a very nice view of the beach and the nearby island of Mantalinga. 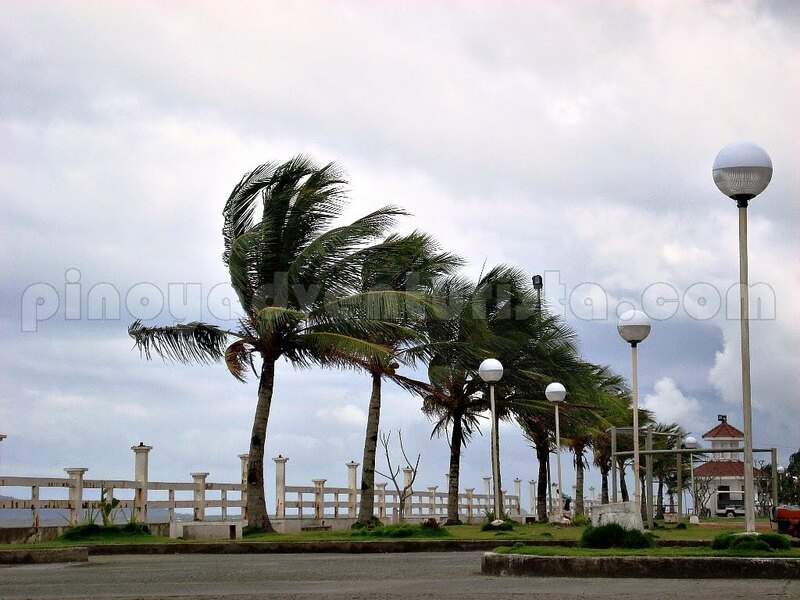 As the wind continues to show its strength, coconut trees are just dancing with its strong gusts. I took some time to just enjoy the park, feeling the cool breeze of the air while waiting for my food to be cooked. After several minutes, I went back to the restaurant to feast on my freshly grilled squid. It would be best to visit it during sunset as you could just watch the sun simply disappear in the horizon while the sky turns into multitude of colors. There are so many things you can do in Baybay Beach and it definitely wouldn’t cost you so much. I just wish I had more time. 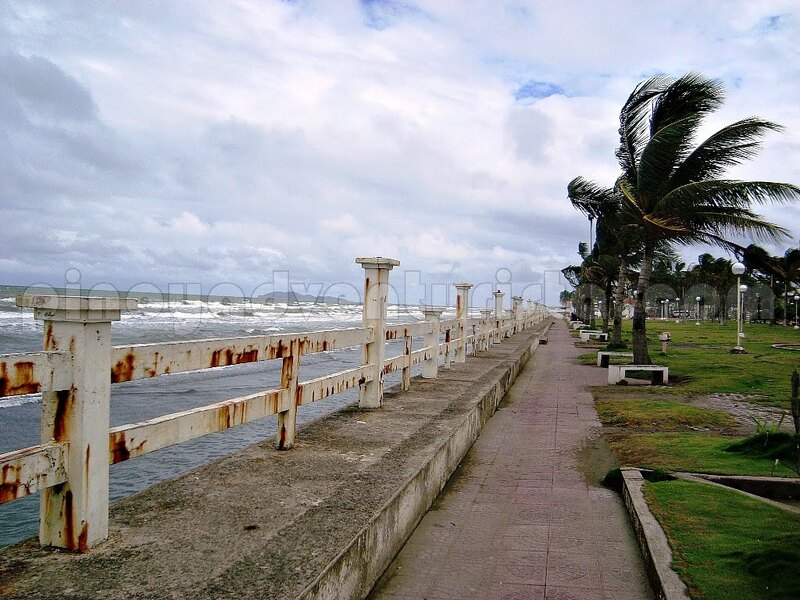 Posted on May 12, 2012 Categories: Beaches , Capiz , Roxas City , Trip ko 'to..
this post literally just brought so much memories! i know what you mean by "freshly grilled squid" and eating by the sea and enjoying the sea breeze in capiz...the freshest seafoods being sold in farmers market in cubao come from roxas city of course! i've known this for my very first out-of-town work-related trip was in roxas city! Yaman. gala ng gala! Sam mo namin kami minsan. hehe. Sarap mamasyal at after matulog pag ganyan ang place at atmosphere! Seafood Capital! Malamang marasap yung pusit sa picture. 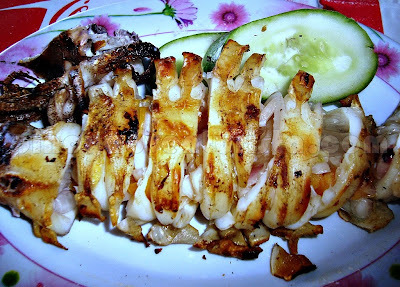 I'm done with my dinner but the grilled squid makes me hungry! Thought I'd never read your post about my hometown.. Lo! Pinoy Adventurista comes to Roxas City! I'm sure you had a great time.. 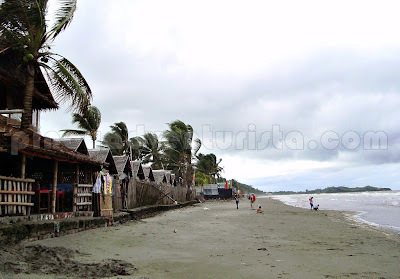 The thing about Baybay Beach is that, it always has strong gust of wind.. but on regular summer days, it calms down. ahahaha!!! love et!!! fresh na fresh! hehehe! I curious with Diwal. I thought you try it. 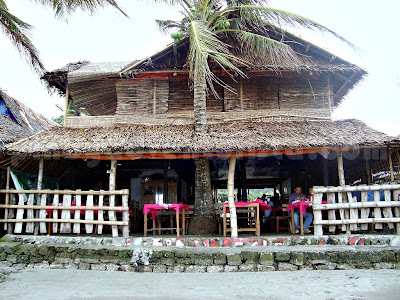 Well, a lot of magazines says that the best seafood is from Roxas City of Capiz... then this is a must-try. i can feel the sea breeze. sarap dyan! nakita mo yung tuyo-an sa kabilang dulo ng beach? been to Rocas to attend a town fiesta. kaloka, happy fiesta ng seafood indeed! haha! ang sarap! Kuya talaga? LOL! Nice one Mervin, kakaingit mga adventure mo. hmmm mag ipon ipon na nga para maka gala din. Roxas! I have yet to conquer you! wow, sarap ng seafood! di pa ako nakadaan dito. Seafoods! It was my first time to eat bamboo shell there in Capiz. We bought ours in Pontevedra, so cheap. Half sack of oysters cost us 100 pesos only. Thanks for this blog. You are really generous in sharing information. When you allow us to copy your blog for personal use it shows how big your heart is. You are way better than the other bloggers so keep it up. Hi! I am planning to do the same thing like you did, exploring Kalibo-Caticlan-Iloilo-Guimaras-Bacolod in 8-days, alone! 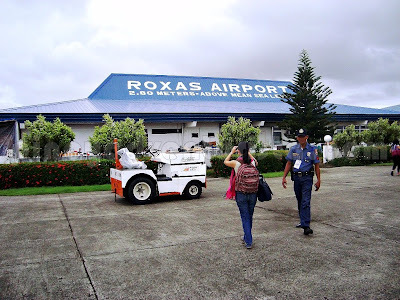 After reading your blog, yes, it's more convenient for me to just stop at Panay and Roxas City than Bacolod. You gave me a lot of ideas and places to visit for my upcoming Visayan tour last week of November. Hindi ba nakakatakot mag-ikot mag-isa especially for a lady? Thank you very much and more power! Hi Josephine, thanks for the visit! I really can't remember the name of the resto. 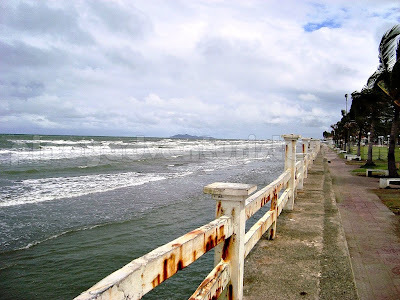 Just go to Baybay beach, then find any resto along the shore... :) have fun in Roxas City!